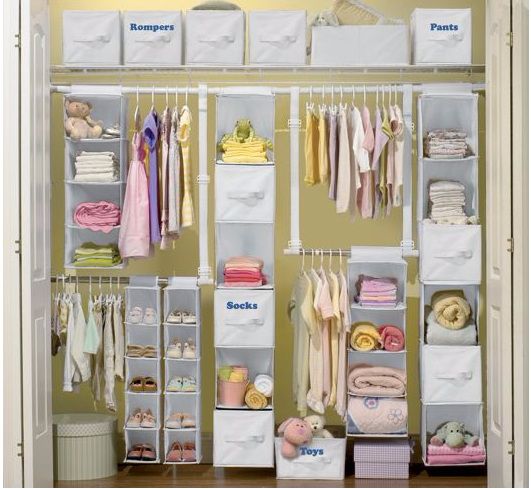 Do you have a small nursery space, but a decent sized closet? Or just don't want to use a dresser for your older kids because of the tipping dangers (IKEA!) We choose NOT to go with a dresser option for our family before Mason was born. We actually have an open book shelf instead and I use that to store diapers, wipes, some books, and blankets for the baby. 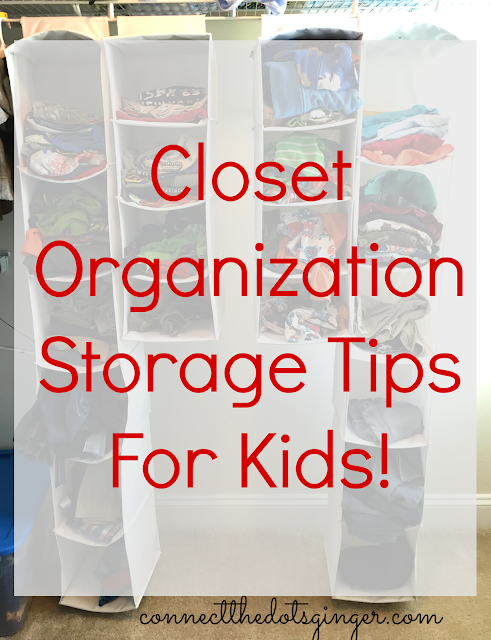 As far as storage areas for clothing I opted to get this Closet Organization system through ONE STEP AHEAD which you can customize for your needs. It is nice to be able to just close the closet doors and everything is put away in its place! We ordered a full set for Mason when he was born, 2- 6 shelfs, 2- 4 shelf, we got an extra 4 shelf for free with our purchase at the time, and 2 bins, the hanging rod and 2 big bins which we use for toys and shoes for the boys and we have been using them ever since. When Collin was born, I just halved what Mason had so both boys have a 6 shelf and a 4 shelf and a bin each. Now with Elyse I ordered her a 6 shelf and a few more bins since she has more small stuff. For the Boys, they have 6 shelves and a 4 shelf organizer each. I organize it with a shelf or two for short sleeved shirts, a shelf for, a shelf for long pants, shorts and miscellaneous stuff. Plus I have a 2 bins for Mason, one for undies, one for socks and a bin of socks for Collin. They are siting on shelf in the closet easy to reach by Mason so he can pick his own clothing. We really do like these. We haven't had any problems with these falling or break, the shelves do sag, but clothing can be pretty heavy, and I really did squeeze a lot of clothing in those shelves. For us they have been great and it is a great way to use the un-useable space in the closet and adds more useful shelving without it being permeant. Have you thought about these as an option for your storage needs in your kid's closet? The way the clothes are displayed in storage here almost gives the closet a bit of a retail shop feel. Like you're shopping for clothes every morning when you pick out an outfit. That'd definitely be something that works for the kids right?